I know its been a million years since I wrote a post… well not a million but a week. This isn’t going to be an essay of a post, more of a short story (I hope). 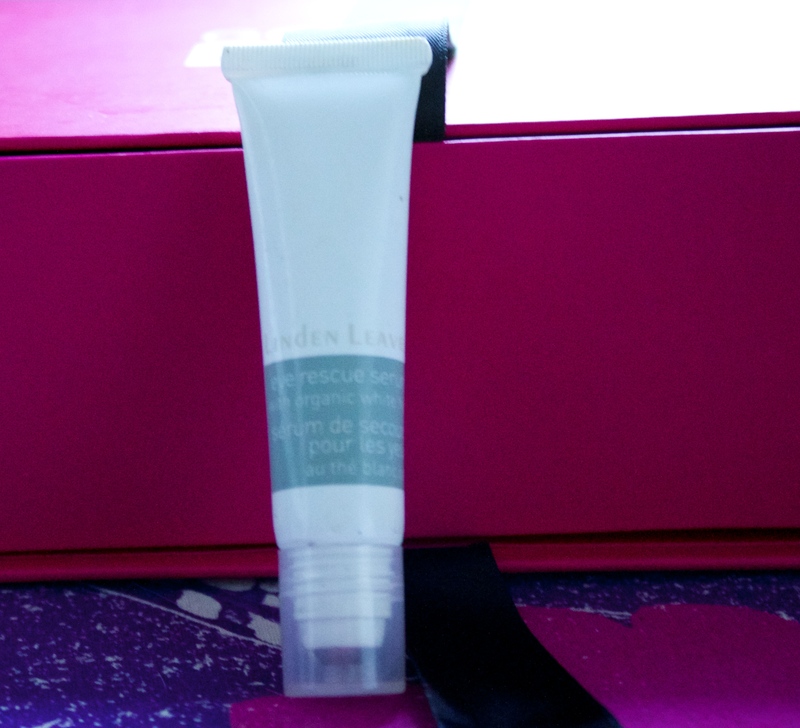 Back when I lived in the UK, I was a keen subscriber to the monthly beauty boxes that are available over there, my favourite being Glossy Box. I was a little slow off the mark here in NZ and have only recently subscribed to The NZ version, Goodie Box. If you’re unfamiliar with the concept of a beauty box, basically its a monthly subscription service. A bit like when you were little and if you were like me, managed to con your dad into paying for a monthly subscription of Dolly Magazine. So every month you receive a box of 5 beauty items, some sample and some full sized, all for $29+p&p. Which you can cancel at any time. This box was their birthday box, so I actually received 6 items. I have to say that I was fairly impressed with this box. Being my first box, I was so happy it came with a bonus 6th product. I also love the quality of the packaging, the colour scheme and how promptly it arrived. The products are a little hit and miss. This is something, that is always bound to happen with a product like this. Not everything will be to your taste. My real stand out product has to be the Benefit, They’re Real Push Up Gel Liner (that’s a mouthful) it is amazing, so opaque, so easy to use, I’m going to purchase myself the full size when I head up to Auckland later in the week. 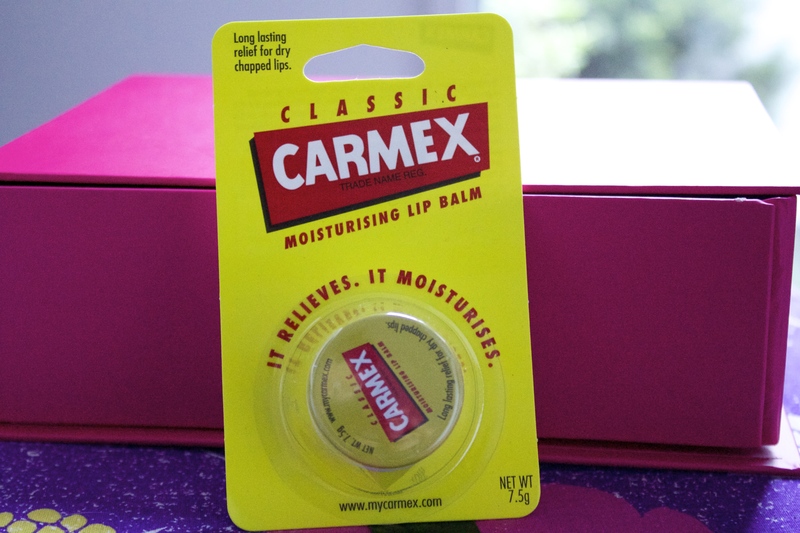 The disappointing product for me, has to be the Carmex Lip Balm, purely because I can not stand the smell or taste. It’s a product that, over the years I’ve tried over and over again to get on with but we just can’t. Just doing a very quick add up and with the amount of full sized products in the lot, you end up with $106 NZD worth of products for a mere $29+p&p. So to me that’s a pretty good deal. Am I impressed over all? I’d probably give the box a 6 out of 10. The ideas there, and I love the fact that you get great value for money, with the amount of full sized items. However, I don’t feel like it stands up to the UK versions. 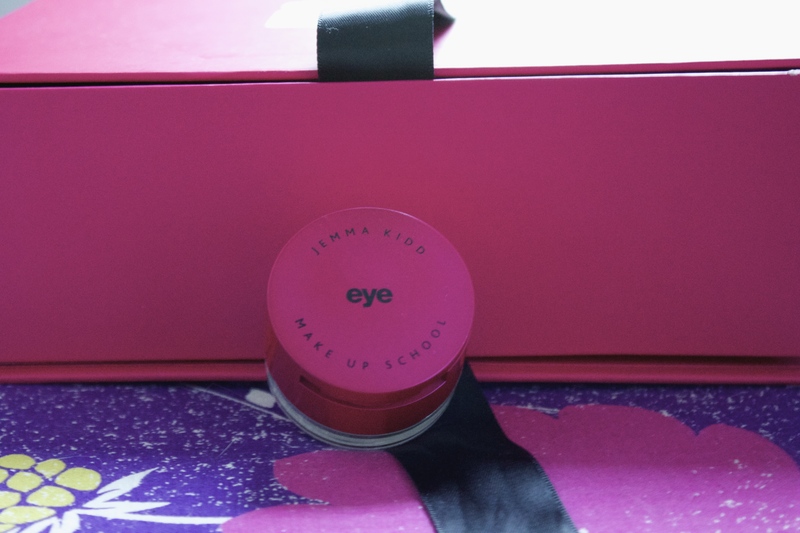 Although I’d probably feel differently if I’d never had the Glossy Box experience. I was also doing a little research and realised that some of the products I received were from last months box. I’m all about recycling but, that to me was a little disappointing. Let’s just say the jury is still out on this one and maybe I’ll give Good Box another chance to impress. As I start this new week, I thought what better way to start than with a post all about what I’m currently slapping on my face make up wise. This in turn means that there will be a few cringe worthy selfies to follow below (sorry, not sorry). Today was pretty uneventful. I have however, got the day off work. I love days off work, and not because I don’t enjoy my job, I do. But because I often like to use this as my time to get ‘Glam’, even though I know, at the very most all I’ll probably do is pop to the shops. It’s fun to have a play and get out items that I’ve neglected and fall back in love all over again. And today my friends, was definitely one of those very days. Nars ‘Barbarella’ Lipstick RRP $51 NZD Mecca Cosmetica. Tanya Burr Lipgloss ‘Afternoon Tea’ RRP £6.99 Superdrug. NB: Please do excuse the fact that some of the products pictured above look well, a little well loved. Starting from the top is L’oreal True Match Foundation in W4 Golden Natural. This has very quickly become a cult within the make up community, thanks in large part to the amazing Lauren Curtis. If you don’t know who she is go check her out, you won’t regret it (unless make ups not your thanng). I’m so happy she brought this puppy back to my attention. I remember this was my very first foundation I ever bought. I was 17 in Duane Reade, New York City, at Christmas, with my family. Am I painting a good enough picture?. Anyway, I clearly remember thinking that I was now old enough to use foundation. I chose this one, pretty much purely because Beyonce was on the picture above the stand and even then I knew, if the Queen that is Bey used this stuff well, then so should I. Long story short its been an almost 10 year on and off love affair. It’s a medium coverage however, you can build it up to a full coverage, likewise you can also sheer it out by adding a little moisturiser, if you prefer a more natural look. It stays in place all day, which I love especially for work. It also photographs well, considering it has an SPF 17, none of that horrid ghost face in any of my pictures. It’s available in NZ at Farmers, Kmart and most pharmacies that stock L’oreal. I got mine on a recent trip back to my local Boots in the town in Essex that I grew up in. Give it a go, you won’t be disappointed, I hope! Next up is Collection Concealer in Warm Medium. A recent purchase as of last week. I was over the moon, over joyed when I saw Shaaanxo post on Facebook, that we can now get our hands on Collection in little old NZ. Lets us hope that this is a good sign and slowly we’ll catch up with the rest of the world. I have used this in the past and loved it. The only reason I stopped was because it was so hard to get here. And now its in my local Supermarket down the road, thanks Countdown! It’s a beautiful concealer. I use this under my eyes and find its enough to hide my big blue under eye bags. It perks up my face, giving me that ‘Oh, yeah I got 10 hrs beauty sleep’ look. It’s creamy enough to blend but has real staying power, that if I forget to powder it doesn’t really matter. It’s also good enough to tackle any pesky blemishes that rear their head. The colour match is pretty much spot on too. As I mentioned I purchased mine here at Countdown, but it’s also available in the Uk at both Boots and Superdrug. Onto matching the colour of my face to my body, and in comes Bronzer and my bronzer of choice is the ‘Chocolate’ Bronzer as its commonly known by Bourjois. I’m not going to lie but, I’ve had this in my stash for around two years… however, I only cracked into it about 6 months ago, so technically thats not bad right??. I have always been a Benefit Hoola girl. Since funnily enough that trip to New York. Anyway as I said, this have been at the bottom of my collection for a very long time and I’m so pleased I took the time to take it back out. It’s a lovely Winter bronzer for me. As I’m naturally quite tanned, I like to top this up in the winter months with fake tan, like many of us out there. This bronzer really just helps to pull everything together. There’s little, to no shimmer and the colour is a warm bronze, which is great in the winter. I got mine once again in Superdrug in the UK, however you can purchase your own one here courtesy of my favourite website ASOS, who also do free Worldwide shipping, whoop. Blusher, Blusher, Oh how I love you dearly. Blush is one of my Essential make up items. I just adore the heck out of it. I feel like its the icing on the cake, that just completes the whole look. This Creme Blush by MAC here in the shade ‘Posey’ has been a product I’ve loved over and over. It’s a constant in my make up bag, especially in winter. I always get comments on how good my skin is when I wear this blush. To put it simply, it’s a dewy dolly pink colour. The finish gives me a ‘just popped out into the cold’ glow to my cheeks. I really think it would look great on most complexions. I use it as base for my powder blush. Which leads me straight onto Nars ‘Outlaw’ which I layer on top of Posey for a longer lasting blush. Outlaw is a Rose pink with Golden flecks running through it. I love this shade as the gold transfers onto the cheek as more of a sheen, rather than full on sparkle, which is something I’m not too keen on. This can be picked up in NZ from Mecca Cosmetica here or in Space NK or Sephora if you’re in the US. Moving swiftly onto eyes. I always start with some form of a primer. I have oily lids, so this is a MUST. Today’s primer of choice was in the form of the Bobbi Brown Long Wear Creme Shadow in Rose Gold. I was very lucky to get this as a present from my Dad. He picked it up in duty free as a part of a travel gift set. He’s pretty awesome like that. This is as the name suggest a Rose Gold. Which looks beautiful on its own, but for me personally works at its best as a primer. 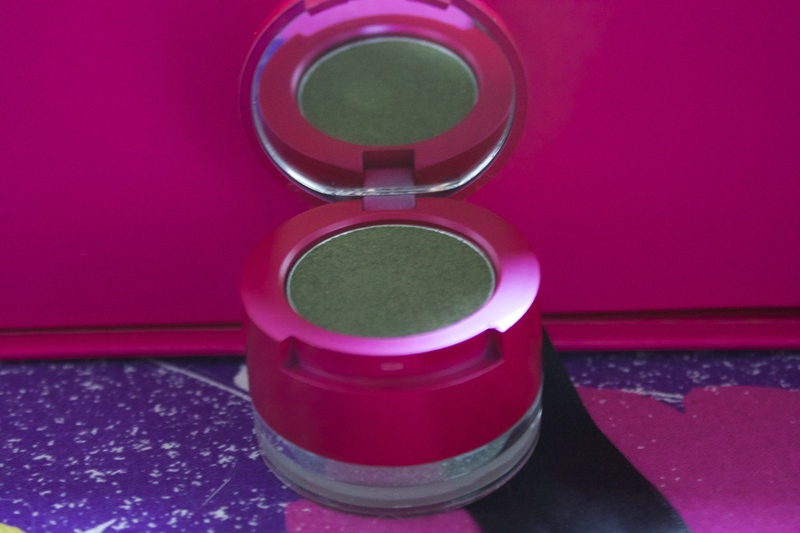 Its long lasting and makes sure I have crease proof lids all day. It’s available at most department stores around NZ that have a Bobbi Brown Counter. 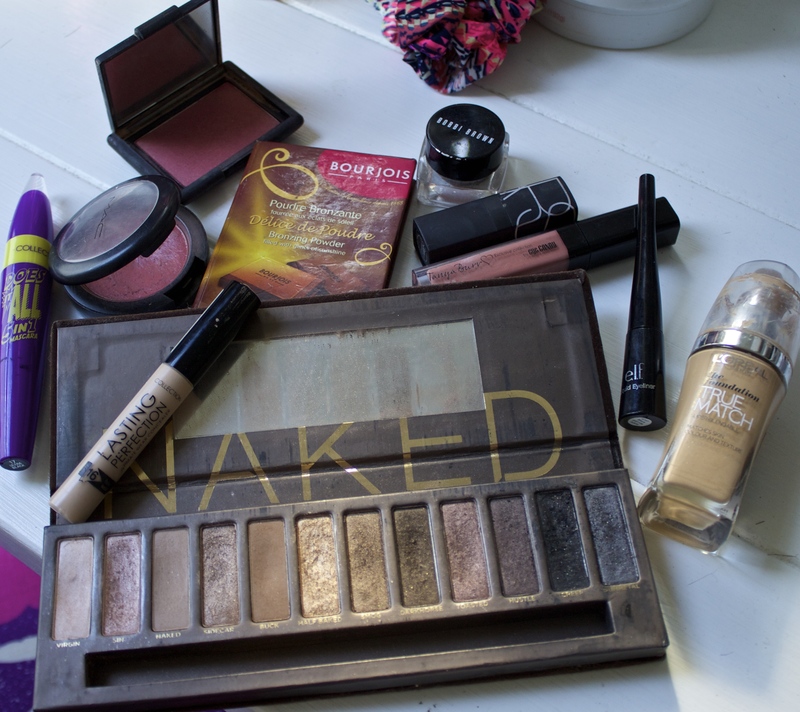 On top of that, to give my eyes a little more oomph I turned to my trusty Naked Palette by Urban Decay. Another constant in my make up bag. I got mine here from Beauty Bay. They too do free shipping internationally. I could go on about this palette for a life time, but this post is already an essay, so I’ll refrain. I used three of my favourite shadows; Sin, a shimmery pale pink tone; all over the lid. ‘Naked’ mixed with ‘Buck’ two mid tone, matte brown colours to define my crease. This is one of my go to combos, when I’m feeling lazy. Eyeliner is an item I have a love hate relationship with. I love the look that a winged, cat eye liner gives you, especially as I have almond shaped eyes. However, I’m partially blind in my left eye, this therefore makes applying it a little bit of a pain in the bottom. My eyeliner of choice today was the E.L.F Liquid Eyeliner in Black. I got my one from Iherb when I was ordering my vitamins. But I’ve also seen this stocked in Kmart. It has a fine enough nib that, it makes application fairly straight forward, with the ability to create both a fine, natural cat eye to a thicker more dramatic one. Its matte black, which is great and stays put all day. My only tip with this product is to defiantly wipe the nib before applying to avoid too much product and those dreaded panda eyes. Mascara. This is my desert island item. Without it I look even more like a 10 year old, with bug eyes. With it I look a little more presentable. Once again Shaaanxo is to thank for this purchase. She mentioned this Collection ‘Does It All, 5 In 1’ Mascara available here at Countdown (once again thank you Countdown) was an awesome dupe for Benefits ‘They’re Real’. And man was Shannon right. I’m converted to this mascara, so much so that, this is my second tube. I’m normally very fickle with mascara so, buying another one was a huge deal for me. If you’ve used ‘They’re Real’ then this is pretty much the exact same result but a whole lot cheaper. It’s also way easier to remove. 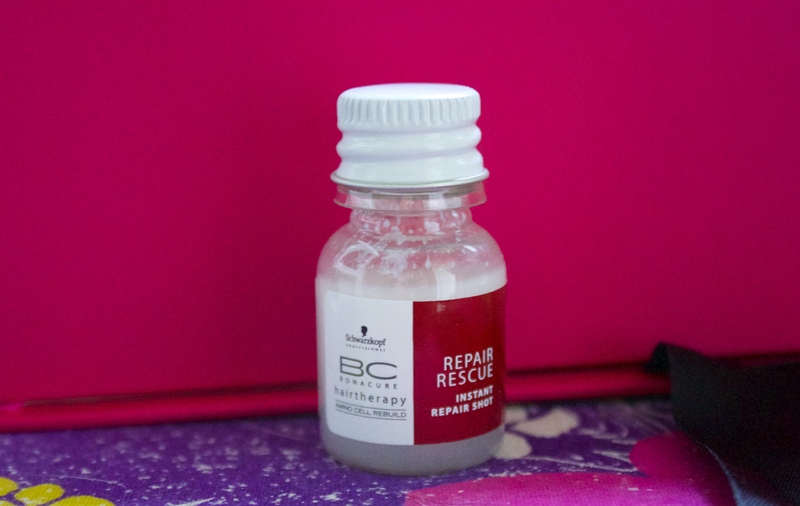 This curls, lengthens and thickens my eyelashes, what more could I ask for really?.Oh no wait… It also makes my pretty non existent bottom lashes look full too. Its very quickly knocked Maybelline the ‘Falsies’ off of the top spot in my favourite Mascara of all time, mental list. Then comes Lips. Lipstick of Choice for today was dug out from the bottom of my make up dresser. Nars ‘Barbarella’ a gorgeous light coral, pink shade. You can get this one again from Mecca Costmetica It’s pretty non offensive colour and teamed with Tanya Burrs Lipgloss in ‘Afternoon Tea’ available from Superdrug, you’re left with a lovely peachy, pinky, coral lip, which I love for days that I’ve got a bit going on with my eyes. The blush looks very strong here, I promise it’s a lot softer in real life. What’s a post without my little monkey!